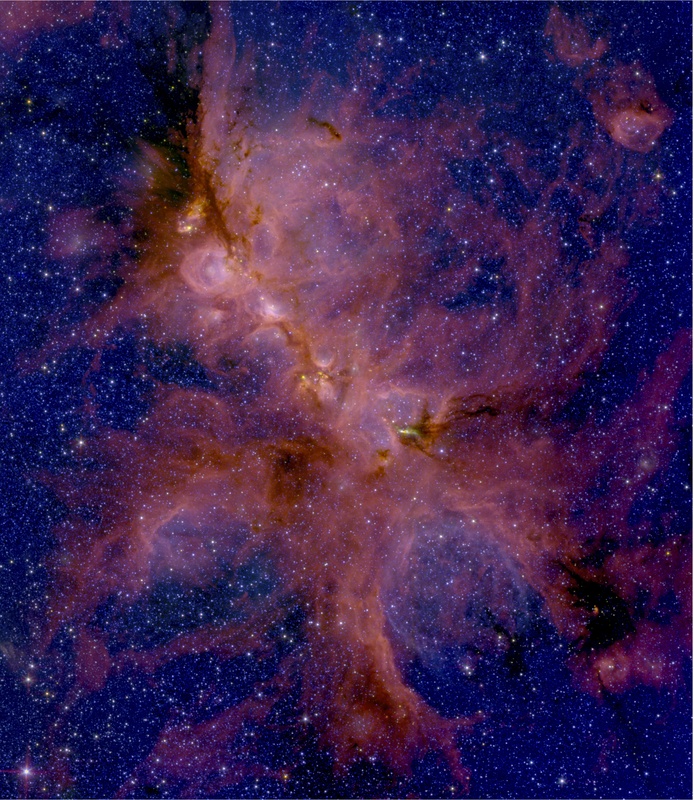 In this composite infrared image of NGC 6334, pink shows gas and dust that make up the nebula, illuminated by bright high-mass stars. Many young stars appear yellow to red and most are found buried within the dark clouds extending from the upper left to the lower right. High-mass stars peek into view by carving out bubbles within the dense clouds of gas and dust that formed them. Click on the image for a high-resolution version. Credit: Sarah Willis, Harvard-Smithsonian Center for Astrophysics; NASA/Jet propulsion Laboratory at Caltech/Spitzer Science Center; Cerro-Tololo Inter-American Observatory/National Optical Astronomical Observatory/Association of Universities for Research in Astronomy/National Science Foundation. Scorpius is one of the few constellations I can regularly pick out in the summer sky. It often sits low on the southern horizon, with two bright stars marking its pincers and the red multiple star Antares highlighting its long body.